I've just started getting to grips with LDD to design a worthy Wayne Manor section to sit atop the cave section of the UCS Batcave. Everything seems generally straightforward even though the threshold for mouse movement to set the next brick where you want to go at times seems a bit hit and miss. 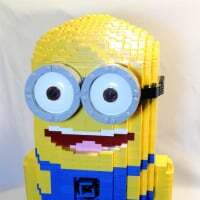 I've encountered a few occasions where i've attempted to attach something and the program hasn't let me (illegal connection) which is handy to know and the parts selection seems fine even though there are a few parts not shown in a colour that I have seen available on bricklink. I was scratching my head last night though, I couldn't find the simplest of parts anywhere in the parts selections - the humble 1x1 round stud. Can anyone let me know under what part subsection menu they reside? I believe they are under the plates section of parts (not on my home computer so cannot check). You can always type in the part number in the top left search box and the part should come up. I will check out the above tonight when I continue with my LDD file, thanks! For such a basic/common part I thought it would be as easy to find as a 1x1 tile. Rounds/curves are under the wedge plate icon. Also if you can't find a part in LDD, but can find it in Bricklink you can put the part number in the search box in LDD and it will bring the parts up and show what category icon it is under so you can find it again.